Fishing in saltwater is a blast, but the harsh elements can be murder on your outboard if you don’t flush afterwards. Most of us take good care of our marine equipment. We wash and wax our boats and outboards, change the oil and oil filter regularly, and replace the fuel filters, but what about your outboard’s cooling system. Unfortunately, it is often overlooked in a maintenance regimen. During the course of normal use, the water pump can ingest mud, sand, and silt, which then flows through the engine. Marine growth can also occur behind the inlet screens interrupting the flow of water to the engine. Over time, debris can accumulate in the outboard’s cooling passages. This build-up can damage the water pump’s rubber impeller and plastic housing. Eventually, the buildup can also restrict the amount of water available to the engine resulting in poor cooling, which will damage the engine. It may even promote corrosion in the exhaust system because increased engine temperatures-along with the effects of using ethanol blended fuels-can cause increased exhaust temperatures. The outboard should be flushed after every use in salt or dirty water. Freshwater flushing with clean water will dislodge most contaminants (sand, silt, mud, etc.) and force them out of the passages in the cooling system. Perhaps even more importantly, flushing removes salt buildup, which can lead to poor cooling as well as corrosion of the engine block and midsection. The cooling water system of an outboard is critical to the survival of the powerhead–passages have to be kept clean and smooth by frequent flushing with fresh water. Generically speaking, there are three methods to flush an outboard: using a flush bag, flush muffs or the freshwater flushing attachment built into the outboard. 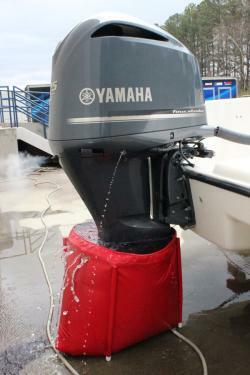 What: A flush bag is a sturdy collapsible bag that fits under the lower unit of the outboard and fills with water. Submerging the gearcase allows the motor to take in cooling water from the inlet screens and return it to the bag through the propeller. There are different bag designs; some are designed to be used with the boat moored. Where: Use the Flush Bag method with the boat on a trailer or the boat moored. It requires running the engine (but only after the bag is filled with water). 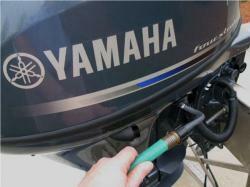 Outboards with more than one inlet on each side of the lower unit should be flushed using this method. Watch for water coming out of the pilot tube at the lower rear of the cowling. Run the engine for 10-15 minutes. A flush bag is a sturdy collapsible bag that fits over the lower unit. What: Flush muffs are rubber cups that fit over the water inlet on the gearcase (one of the cups has a hose fitting). They require running the engine (but only after the garden hose is in place and water running). Where: Best done with the boat on a trailer or a lift, completely out of the water. Turn the water on slowly, until you can see a bit of water leaking from around the flush muff rubber cup. Flush muffs are rubber cups that fit over the water inlet on the gearcase. Never run the engine without cooling water. Turn the freshwater on before starting the engine; turn the water off after stopping the engine. Running the outboard with little or no cooling water will cause expensive overheating damage in a very short time. Don’t rev the engine while using flush muffs, because there isn’t enough water flow/pressure to sufficiently cool the engine at high rpm. What: A built-in flushing device is a hose fitting, usually located near the lower rear cowling. Do not run the engine during this procedure. Where: An outboard can be flushed with the boat on a lift or in the water; it works best if you can trim the engine up so the gearcase is out of the water. A built-in flushing device is a hose fitting, usually located near the lower rear cowling. There is no single best method for flushing an outboard motor. There are only best methods to suit the circumstances. For example, the flush attachment method is the easiest and quickest for a boat that is moored, while the flush bag method is particularly useful on motors with multiple inlets per side. In addition, the flush muff method and bag method are the only methods to use when fogging the engine for winter storage. 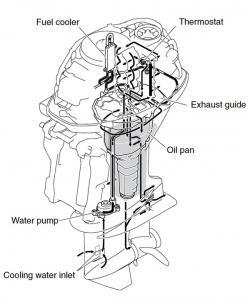 Testing has shown that even the flush attachment method allows water to pass into the cylinder head passages, in spite of the fact that the thermostat does not fully open. This means that there is no disadvantage to using the flush attachment. While conventional wisdom might indicate there is some benefit to flushing with the engine running-such as with flush muffs or a flush bag-there is no clear data to indicate this is true. What’s important is to in all cases, regularly check to see that water inlet screens on the lower unit are clear and clean. Flushing your outboard with freshwater on a regular basis can go a long way toward extending the outboard’s life span – especially for those who boat in saltwater. Freshwater flushing is easy and cheap, so keep the garden hose handy.